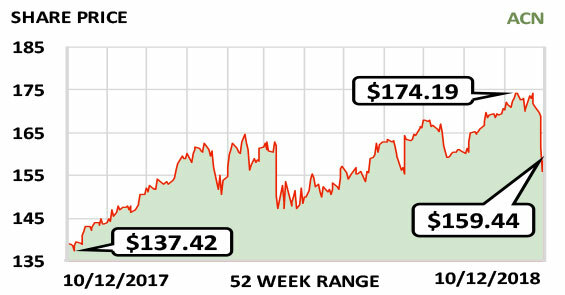 This week’s Stock of the Week helps companies from many different industries integrate with and get the most out of the digital world. Accenture Plc (ACN) is an Ireland-based professional-services company and top provider of consulting, strategy, marketing, analysis and other services for more than 75% of the Fortune Global 500 companies. It advises companies on issues such as industry consolidation and the effect of regulatory changes around the world. It is involved with every aspect of efficient business operations from research and development to human resources to strategic planning and operational streamlining. It has expertise in multiple industries including communications, media, technology, retailing, health care and more. The company continues to land large contracts from corporate clients worldwide, and its retention rate for existing clients is very high. Rising interest rates could curtail merger-and-acquisition activity, one field on which Accenture focuses, but its other business areas should keep growing well. Revenue is rising quickly. It was $34.9 billion in fiscal 2017 and likely will be $39.5 billion in fiscal 2018 and $41.4 billion in fiscal 2019. And the dividend of $2.66/share/yr., recently yielding 1.7%, appears secure. Fiscal year: August. Earnings per share: 2019 est./$7.22…2018 est./$6.72…2017/$5.91. Harry Berkowitz is personal finance editor of Bottom Line Personal, which puts him in charge of articles on topics ranging from investing and saving to credit cards, home buying, insurance and Social Security. He is also editor of the online "Stock of the Week", which highlights attractive stocks based on analysis by top investment experts. Harry's journalism experience covers four decades, including 20 years writing on financial matters at the daily newspaper Newsday as well as stints as the business editor at the Courier News in New Jersey and the Stamford Advocate in Connecticut. He is a graduate of New York University.